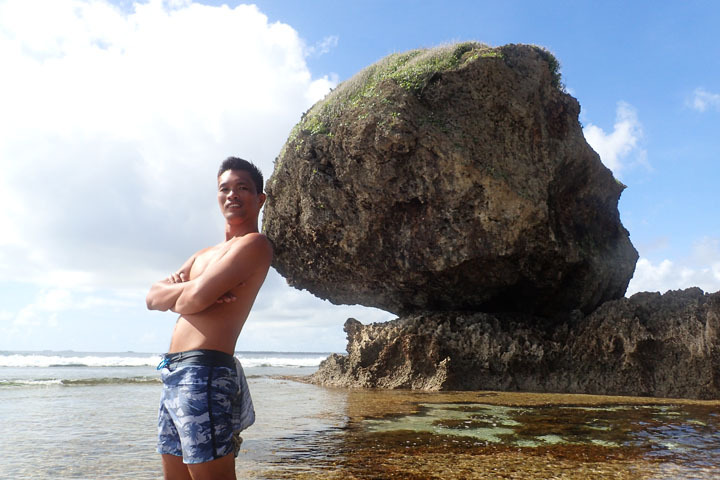 MAGPUPUNGKO ROCK POOLS AND BEACH, SIARGAO SURIGAO DEL NORTE. 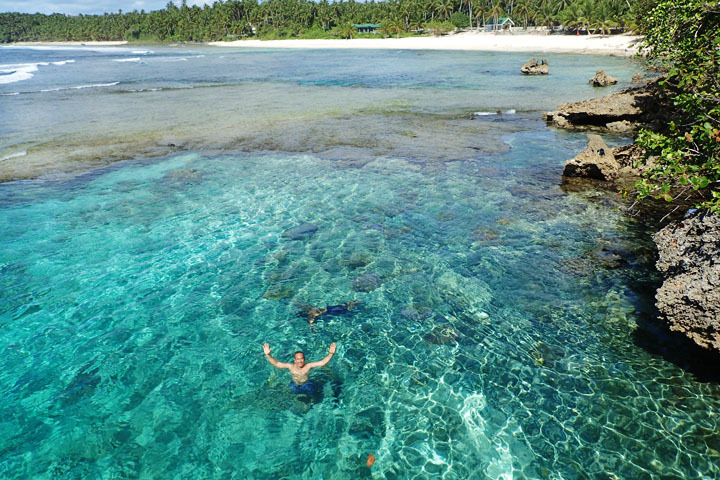 Magpupungko beach and rock pools should definitely be on top of the list of places to visit in Siargao. 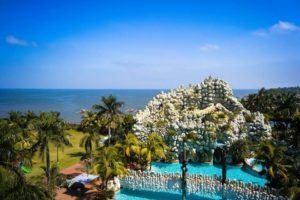 While getting there from General Luna could be a bit too long (more than an hour,) one shouldn’t be discouraged by the long ride because it is well worth it. This spot is such a rare and unique nature site. Cliché as it may sound but the rock pools are really amazing. 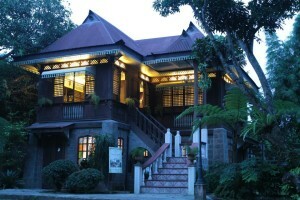 Prior to my visit, I’ve seen how pretty they are in pictures. 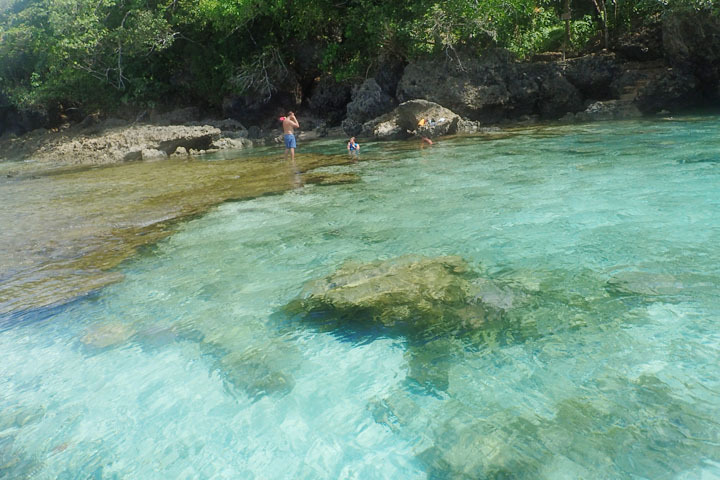 In reality, the rock pools, as well as the scenery, are incredibly awesome. 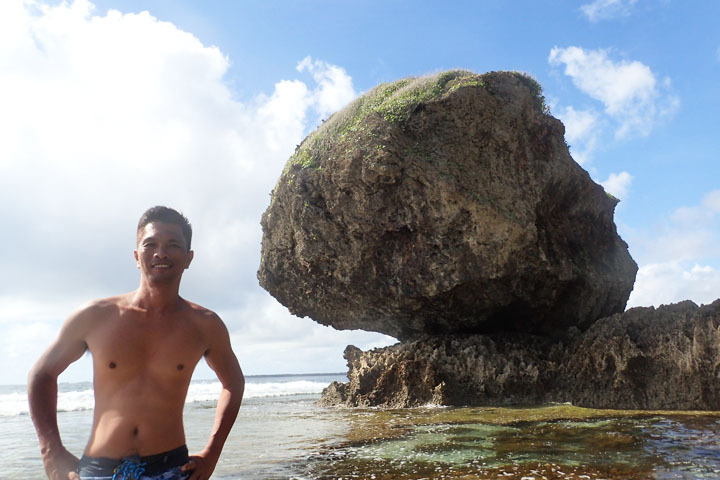 Behind me is the big rock from which the name Magpupungko came from. It appears to be sitting on another rock formation. Pungko means squatting or sitting in the local dialect. 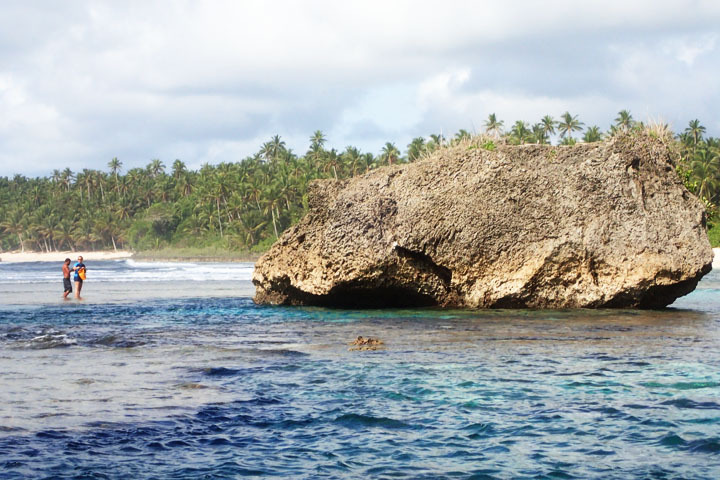 To see the natural pools at their prettiest, it is best to go there during low tide. 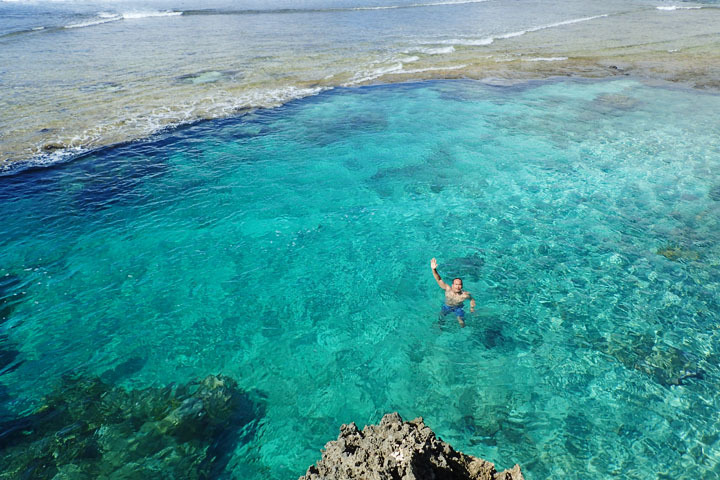 The rock pools are actually a part of a large reef which separates them from the sea. 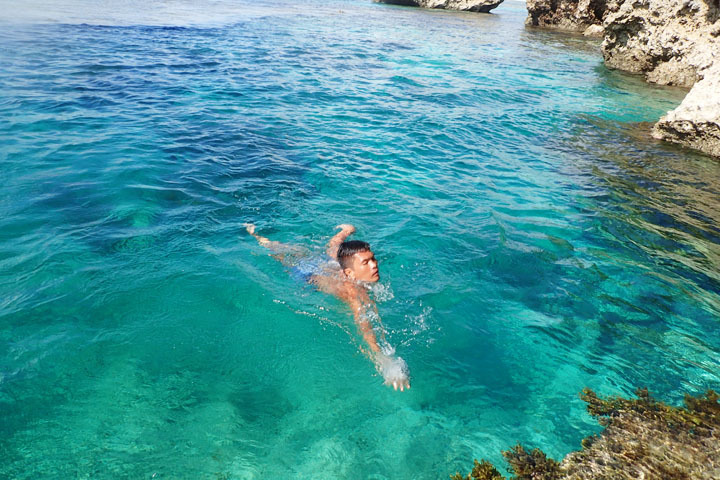 As the water level goes down, the reef as well as the rock edges of the tidal pools become more visible, defining lovely natural swimming pools with crystal clear and deep water that is great for swimming and diving. 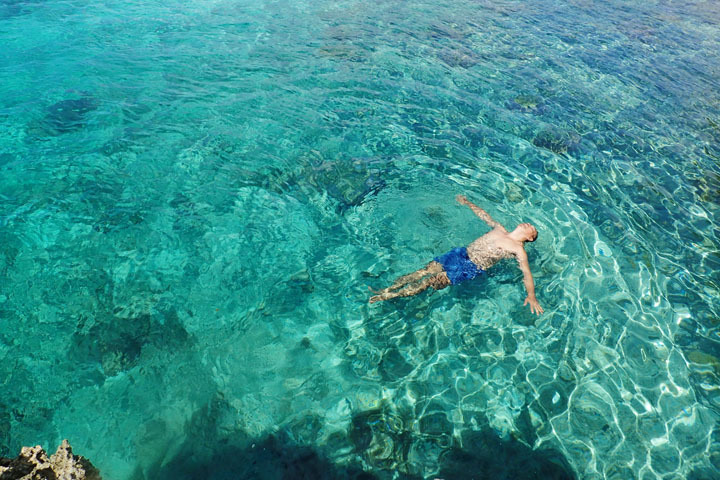 Low tide usually occurs early in the morning or late in the afternoon. One needs to be very careful when walking though, because the rocks can be slippery, irregular and razor-sharp. I slipped and fell during my visit. Luckily, I only had a few minor cuts on one of my legs and the camera I was holding was waterproof. 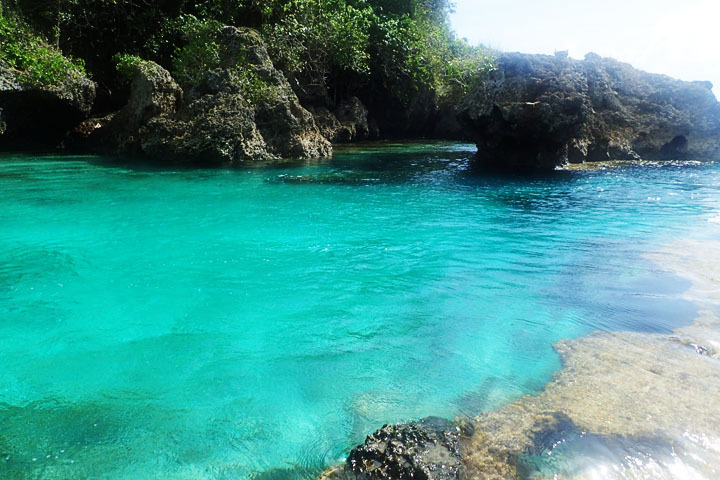 Magpupungko beach compliments the rocky shores where the pools are located. The beach has soft and powdery creamy white sand. There are picnic huts available for rent and you can buy food from the restaurant managed by the caretakers or bring your own. 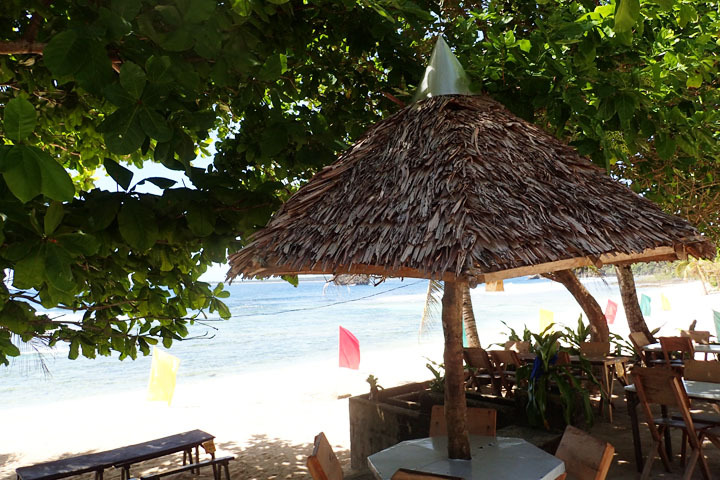 Magpupungko is a great spot to spend a day on the beach. In our case however, we left before lunch time since one of us needs to catch the 1PM flight to Cebu. 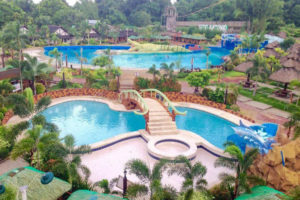 Hi Sir ung habal habal 1000 for two na po un? 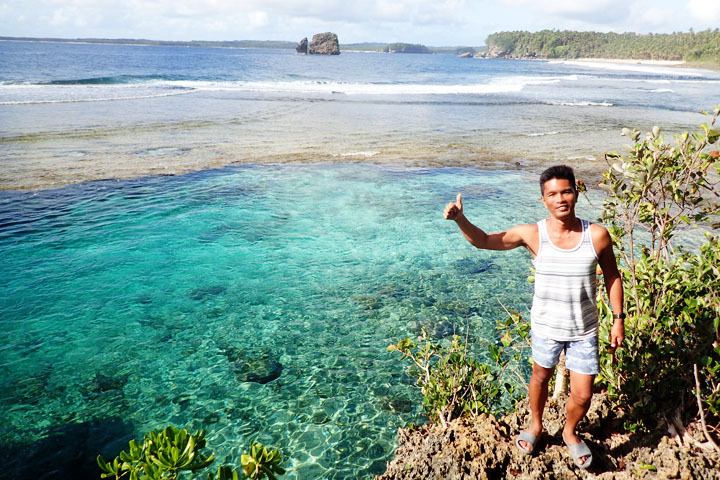 Very practical tips here from Senyor and all other bloggers about Siargao. 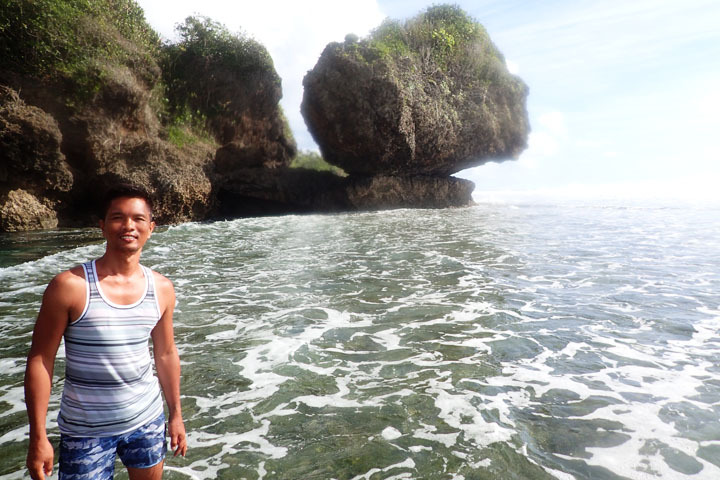 I was able to use those as a guide in exploring the area, myself as a solo traveler. 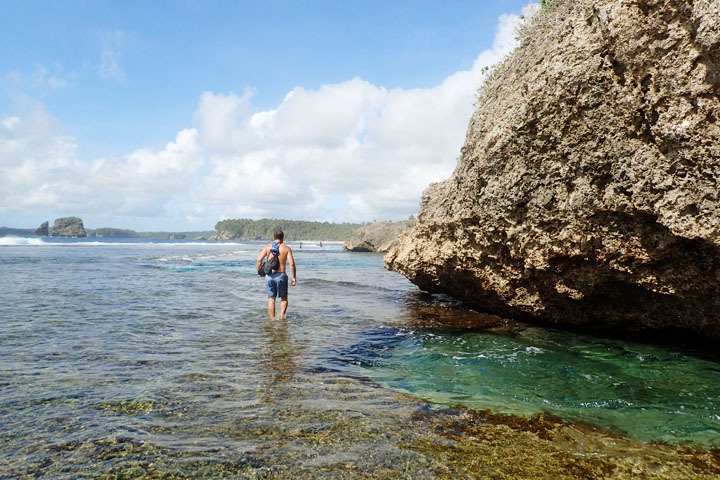 But apart from romanticizing the area in the name of love of country, adventurism or having a wanderlust soul, i think what every tourist should know is that Siargao, sublime as it is, would still have issues in building internal capacity. 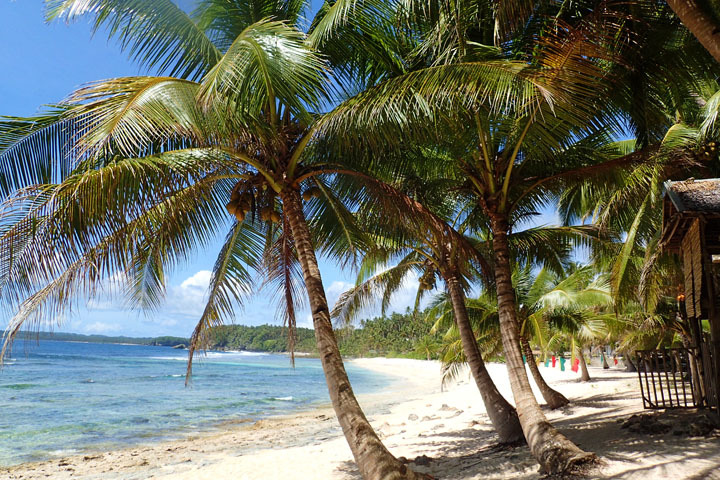 Price, access to hotel services, food and serving time, infrastructures are some issues that tourists have to contend to while they are in Siargao. 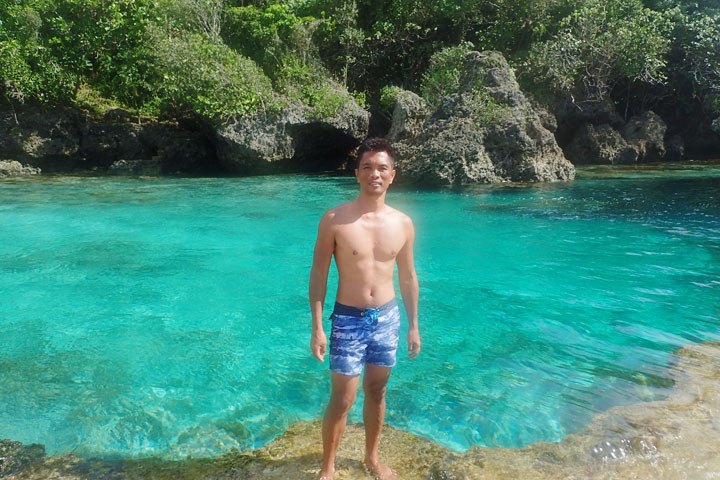 Been to many places in the country, but Siargao remains to be one you’ll come to, over again. But on another front, high price of goods and services is forgivable but not service and food waiting time. We were made to wait for 3 hours in a restau owned by the Brgy. Capt. of Magpupungko, we were so hungry and irate, we have to cancel our orders. 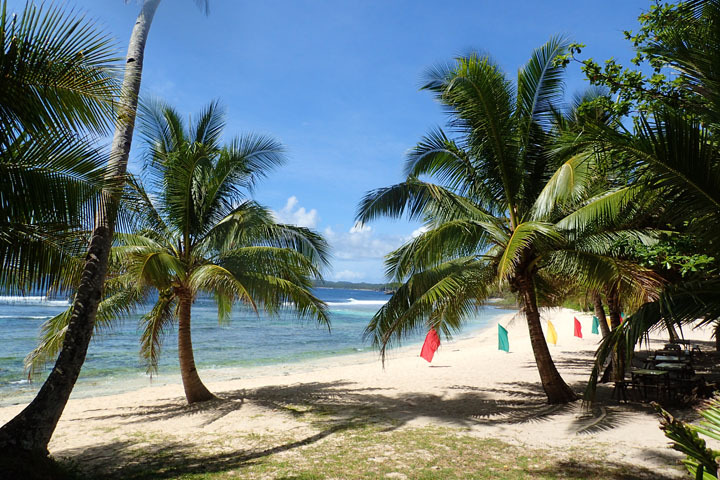 Karen Davila has just exposed the absence of medical services but there is more, Siargao is steeped in traditional politics and had high incidence of poverty despite 1.2 billion worth of yearly appropriations. Go to Dapa to witness poverty eye to eye. I witnessed a traveller from Cebu who has lost her IPAD in Dapa Port while she was securing tickets in the commotion. 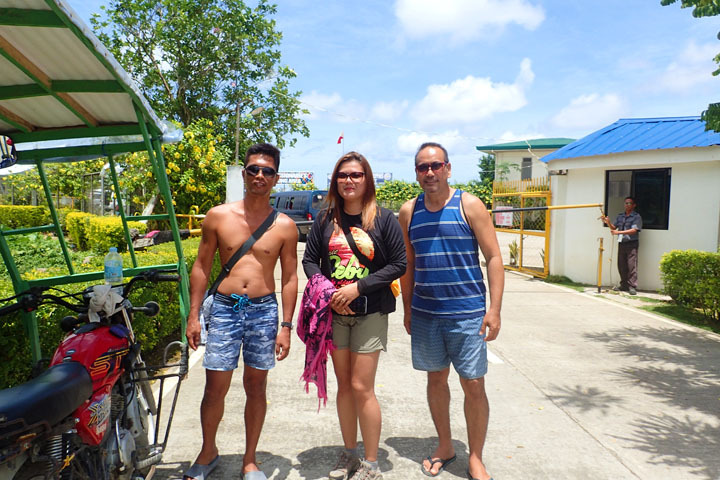 Buzzes from the ground also talked about security cases against female foreign tourists and theft cases committed by errant habal habal drivers especially those coming outside of General Luna (note the motorcycle hood colors, red for GL). 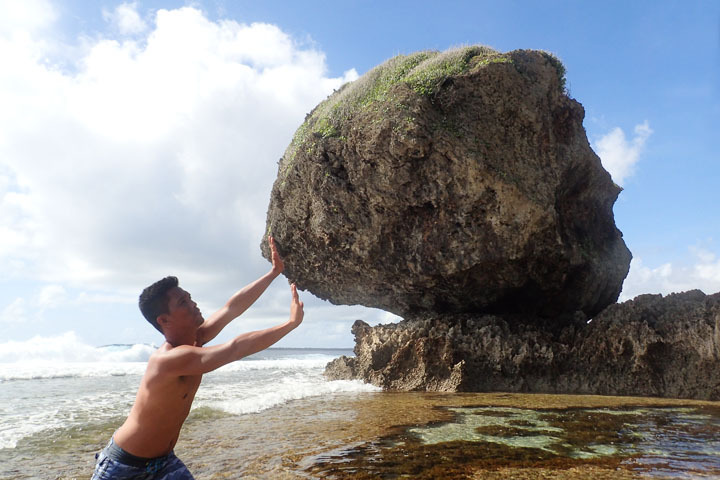 Surigaonons are very kind people, a trait they hand to even to their pet dogs but it is costly to be known as a tourist or a traveller in Siargao. Act local.